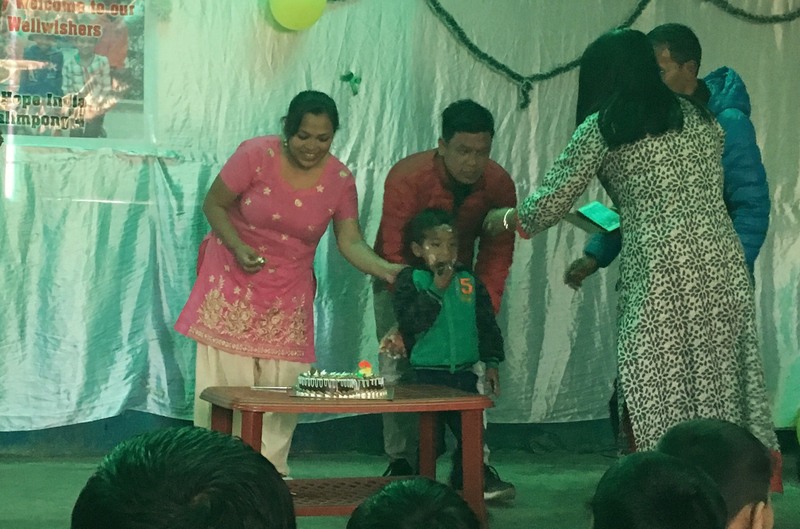 The other day one of the boys at Kalimpong 4, Rohan, had his 6th Birthday. As with all the trips made by Scarlet City we were treated to a special show where the kids danced traditional dances sang Christian songs in English and a variety of other things. The climax of the event was when Rohan was led up front and given a cake with a candle in the shape of a six. As we all belted out the song Happy Birthday he blew out the candles and his parents helped him carve out a very generous slice of cake. About the time they finished slicing we finished our chorus but the room transitioned immediately into a new song with the basic lyrics of "May God bless you" repeated over and over to the tune of Happy Birthday. While this wonderful chorus transpired, both parents began anointing Rohan's forehead and cheeks with great big smears of icing as little Rohan began happily tackling the task of eating his huge portion of cake. As a spectator, I found a deeply profound beauty in this community ritual. In the Hebrew Bible the term anoint is mashach which also has the meaning smear. A Mashiach is one whose head has been smeared with oil symbolizing cleansing. This ritual cleansing was a symbol of one being made pure or holy for a divine task (Exodus 30:22-31). Throughout Israel's history the High Priest was anointed to office as well as the king. Most will recall the story of David's anointing to be king (I Samuel 16:11-13). Ultimately it was Jesus who served as the promised Messiah and through his ministry reconciled us to God through the shedding of his blood. This is the Gospel that no matter who you are or what you have done God has provided the means for you to be made holy through the blood of Christ. This is a wonderful truth, but thank God Jesus gave us the ritual of communion to symbolically recall this truth rather than some blood ritual. While the act of anointing always reminds me of Israelite practice and the ministry of Christ to reconcile us, it is another act of cleaning that has stuck in my mind while thinking over this wonderful birthday cake tradition. It is the act of Christ in the upper room cleaning his disciples feet. In this simple act Jesus demonstrated that his Love is so lavish that it knows no bounds. The cultural conventions that would prevent a Rabbi from performing such a humble task did not stop Jesus from humbly preparing his disciples to commune with him in this last meal together. God's love calls and equips us to love one another in such a lavish way that we should be filled with all joy at the opportunity to humbly serve one another and cleanse one another. As we do this we cleanse one another for the purpose of deeper and greater fellowship around God's table. As we work with the Spirit our unity as belivers grows, and so does our witness. For it is by our love for one another that we spur one another on to good deeds and it is by our good deeds that others will praise our Father in Heaven. So like a child who was once orphaned and lost without a family may we find ourselves happily anointed with cake along with the loud blessing of all our brothers and sisters, and thereby experience God's lavish love.